I just can’t get enough of these. 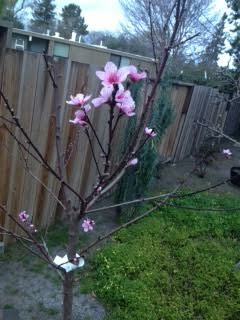 The Indian Free has the biggest, pinkest flowers of any of my peaches. The branch I pruned off it this winter and rooted and planted and pretended to be a real gardener with is up to three leaves today. There was a bud showing a little pink, too, but I carefully nipped it away so it could save its strength: be a tree first before you can be a fruit tree, little one. But boy will it be a glorious when it grows up. I had no idea it would work out that the prettiest tree would be the one closest to Adele, but I’m really, really glad. Oh and yes–there was a bit of knitting done. Took it easy today. Cold, just a cold, no autoimmune attack, just a plain, ordinary, mild germ like everybody else gets: normal is good. Napped for three hours and came to thinking wow, I guess I really was tired. Made chicken soup. Tried to talk myself into working on my new knitting project. (Stitches yarn!) Tried on the now-dried blocked one and hoped the recipient will love it as much as I do. And then finally I went to see what 69F had wrought out there. The Fuji apple had started to wake up, that was new, just the first few leaves here and there. The sour cherry’s buds grew, too, even if not quite ready to open yet; I doused them in ashes from my friend Krys’s barbecue to kill the Japanese beetles I knew would be right on any new growth. I’d been watching to beat them to it. The squirrels have been digging around that tree and I figure they’re going after where those bugs are hiding during the day. Don’t do the ash thing to the far more tender leaves of a pear, though; I tried it last year and got what looked like fireblight, the disease, but was actually a more literal version. All the leaves that grew after that were perfectly healthy. Clearly, as soon as I kick this bug I need to go back to Los Gatos Birdwatcher and buy one of those rent-a-cr0ws that they’re hawking. For Coopernicus’s sake. This was the very nearly bare branch at the back in yesterday’s picture–we’re up to six baby figs tonight with the tree sprouting everywhere now. We were in the longest and I mean longest line at Trader Joe’s. Ten minutes it didn’t move, and the others weren’t much better. I gave a dad with an antsy little girl a finger puppet–and only afterwards realized she had a hospital bracelet on her wrist. She needed it all the more, then. I had time to exclaim to the woman standing next to me over her purse, which was clearly hand knit and hand felted with inner and outer pockets (that takes skill in the felting process), a flap, a full lining sewn in, she showed me–just a beautiful piece of handiwork. Had she made it? Oh she wished! 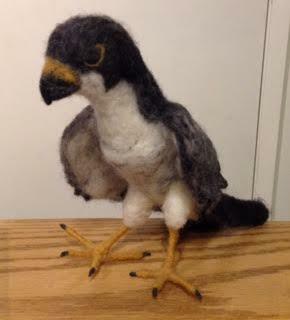 But she did knit; her friend had made this. Did you go to Stitches last weekend? I asked her, sure of my answer–I mean, this local, how could she not have, right? Where we were standing was less than ten miles from the venue. The look on her face! Like she was almost afraid to ask what she’d missed out on but oh goodness she HAD to know! A hesitant, No… What’s that? About a hundred fifty to two hundred vendors and ten thousand knitters at the Santa Clara Convention Center. People fly in from all over for it. Santa Clara. At the Convention Center. There was both profound regret and a deep excitement in her voice now. She hadn’t seen any advertisements. I wondered in return if you had to know by word of mouth, more or less? Next year, she said. She was going! Next year! There is no question in my mind she went straight home and looked it up now that she knew to. And I hope her friend who does such beautiful work goes, too. I came away really glad Richard and I had both felt too tired to tackle Costco so we’d just gone to the much smaller grocery with the short lines. Which thankfully weren’t. While I’m feeling a bit under the weather how about I share a little more Spring. 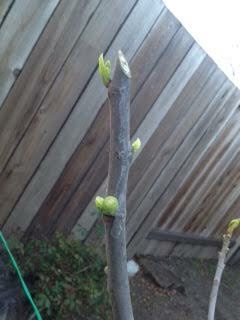 I saw no sign of life yesterday on that fig branch and now it’s got both early leaf and fruit. Meantime, the volunteer fig I dug out of my tomatoes last year has a leaf again–and it doubled in size over the course of the day. If I’m really going to grow that then I need it in something bigger than a flower-bulb-size clay pot. I did a quick count of buds and flowers on it today, probably missed a few, and still got forty-eight. Here’s what it looked like at planting last February. One year. Standard-type rootstock rather than semi-dwarfed is definitely the way to go for instant gratification–we ate its first peach last summer and it was very, very good. I gifted a friend with a chocolate hazelnut torte recently on a day when she needed a hug and I needed to be needed and she swooned and said it was even better than my signature plain chocolate one. Where had this been hiding all these years?! When I gave it to her, we were talking and come to find out to our mutual great surprise her dad is cousin to my late friend Conway–whose granddaughter married my son and is the mother of our three grandchildren. She’s family. Who knew. It is in the oven. And oh goodness, nothing I could ever bake could ever live up to this: she’s bringing me honey from her hives as a thank you. 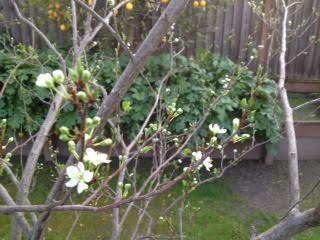 The first flowers on the Indian Free peach opened. The Baby Crawford sprouted five tiny buds today, with a hint of pink at the tips–not bad for a one-month-old. Clara laid her first egg of the season near the top of San Jose City Hall today. I saw not the usual redtail hawk in that area but a peregrine falcon in the hills above town today, well outside of Clara’s territory, and wondered if it was one of our old hatchlings. And I’m going to stop writing and get back to my knitting and man, does it feel good to wrap wool around wood right now. One other Stitches story: I looked down at the basket at the front of my scooter Saturday afternoon and was stunned to find a four-inch knitted square in soft purple merino finished with a little crocheted hanging loop. Oh goodness! The guy laughed off my worries, affirmed it was theirs, and was just plain glad to see me again because that’s the kind of person he is. I was impressed. And deeply relieved it had found its way home and no harm was done. He definitely deserved a shout-out, and Mosaic Moon’s yarns are gorgeous and soft and I spent a lot of time oohing and aahing in their booth. Back home, the third and fourth peach trees are almost in sync: the Babcock started blooming last Thursday, while the Indian Free, my only one that needs a pollinator, is almost, almost blooming but just not quite there yet. Tomorrow. My Baby Crawford that I planted last month, once it grows up a little, should cover any time the Babcock’s not doing the necessary overlapping flowering while keeping up the steady sequence of ripening times. We do love a good peach. Meantime, back when I pruned the vigorous Indian Free, I plunked the largest multi-branch in sugar water and left it in the kitchen a few weeks to see if it would do anything. It sprouted thread-thin roots and I planted it in a pot as soon as I saw them, wondering if they would take and if so how to make the leaf/root balance play out right. A few weeks later squirrelocity today could not make it uproot from that pot. Looking good. And today for the first time it had a spark of green at one node and it made me just about giddy with glee: it lives! It really lives! We don’t need two identicals. I’ve been thinking once it gets going it just couldn’t be that hard to find someone who wants glorious spring flowers and nice-sized leaves, a tree that is highly resistant to peach leaf curl, and if there’s a pollinator nearby all the better and they’ll have Thomas Jefferson’s favorite peaches but it would be worth having even without that. It’s a pretty tree. Without a grafted root stock I can only guess that it will want to be quite tall: future yarn bombers take note. Let’s wait till we see a second leaf or three, though, m’kay? But still. Looking at it feels glorious. To life! We met his grandparents when we moved to California while his dad was away at college. We got to know his parents better when they lived here their first few years of marriage; they moved to Richard’s hometown and we’ve been able to randomly and delightfully run into them at times. Now their son Will is in college himself. And you know, you just know, now, that Will’s future wife will expect him to always, always take out the trash. The Woolbuddy booth had a towering felted-wool T-Rex dwarfing its creator. One of my friends put a photo of it on Facebook last night with a caption that made me laugh and Richard leaned over to see what was so funny. To my surprise, his reaction was, But what about the grandchildren? As in, how could you not make them…! Ask and they shall–hopefully–receive? My first will probably look nothing like those by someone who’s made a lot of these, but we’ll see. And I don’t know yet how holding a needle with that tight a grip for long periods will work out, but it does look like it’s going to be great fun making these. The Woolbuddy artist certainly puts a lot of delight into the concept. Two vendors when I saw them made a point of saying they’d missed me last year. (I had the flu). Blink. They’d noticed? I did not expect that. At all. They quite made my day. Susan of Abstract Fibers surprised me with this yarn two years ago and it’s a great favorite of mine, so I had to show her the cowl it had turned into: nice and warm (needed that today) and it’s one of those things that when you put it on, you know that whatever else you might have going on, hair, whatever, it doesn’t matter, you look good today, y’know? It does that. Someone stopped me and asked where the pattern was and how I’d gotten it to be wider at the bottom and she really liked it. I confessed it was a doodle. Karida of Neighborhood Fiber Company–love her and her colors, too. And Lisa Souza and her husband Rod. Across from them, Sheila and Michael Ernst with their glasswork. Kate and her team at Dragonfly Fibers. and the surprise of finding out she’s in my husband’s hometown and we could swap a memory or two on the old Inez’s Needlework shop that used to be there. The late Inez had everything going all the way back to the ’60’s. Plastic canvas needlework could be yours, old cross stitch kits, good yarns, too. Kris Kunihiro was there with her son Ben. These little bowls were shallower than their rice bowls, and with a lip they were perfect for what I wanted. A little bowl for each person’s sour cream, a little bowl for each person’s brown sugar, a bigger bowl with all the strawberries you might possibly want to dip into the one and then the other. You can never have enough of those. And tomorrow I get to go all over again and see even more old friends all day long. I might even remember to take an actual photo there this time. Behind her, she gestured, were two stuffed quite lifelike crows, one upright, one not so much. You put one keeled over in your yard for a week. “At night,” the middle-aged woman behind her working on the books interjected without looking up. Having read Marzluff’s book, Gifts of the Crow, yes, those are behaviors they do and yes definitely you’d want to put it out at night and I was glad to be reminded of what I’d read–because otherwise they would think you had killed it and they would teach their offspring to retaliate against you to the third and fourth generation: attacking, pooping on your car, stealing the rubber off your windshield wipers, you don’t mess with crows. Now, going outside and swinging my arms like I do they’re fine with–they understand territory claims and it’s an accepted thing. But hurting one of their own. Oh no. They will get you. I need me a toy crow. Definitely. Feet up. Do not go out at dusk but only at the darkest of night and given the city lights I’d still put a hood half over my face. I can’t wait to loan it to my neighbor whose persimmons will be in full production come December when all my trees are done for the year. I’ll have to drive the car away for hours the next morning after I put it out there so that they know I’m gone and that they can land in my yard to pay their respects. I had two projects I wanted to finish before Stitches: one for the pride of showing the thing off, and I really wanted to, and the other for the sake of someone in particular I badly wanted to give it to. I was adamant with myself that I was going to finish that gorgeous silk first. I kept starting and finishing other things altogether till I gave up on the pride and dealt with the fact that the other was the recipient’s favorite color, not mine, and dove into that gift project at long last. It is now blocking, with all the magic that is lace+water=gorgeous. Looking at it, I marvel that I ever had a problem getting myself to sit down and work on that. The anticipation (with a bit of relief thrown in) is sweet. One thing to mention from yesterday. I heard the mailman and went out to the mailbox and there, standing shyly on the sidewalk, was the tall young dad from across the street, holding his baby boy, his three-year-old daughter clinging to the side of his leg when she saw me coming. The dad was glad I’d come out–he’d wanted to explain why they were standing there and there I was, making it easy. Our oxalises were blooming and she’d wanted to come over and look at the pretty flowers. There was a long-stemmed dandelion flower in her hand. 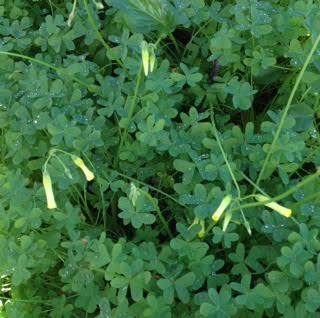 I remembered the spluttering and outrage of a gardener, years ago, when I stopped him from cutting my yellow patch down–to him, oxalis were weeds and a nuisance and he glanced down the street to see if any of the neighbors were seeing him being derelict in his work. But to me they were what had invited me to walk in to this house the first time I’d seen the place. They don’t seed, they don’t spread, they just bloom in their spot every winter and then quietly vanish at the dryness of the summers to await their rebirth. I explained to the little girl that the sun was going down so the flowers were closing up for the night, but they would open again in the morning and you could still see their pretty color. She looked at me with big eyes and tucked herself behind her daddy and peeked out as I smiled. I leaned over and picked a stem with a nice little cluster and offered it to her. She let me give it to her. Her daddy thanked me warmly, and we each went back inside to work on our respective dinners, with me plotting of peaches and plums to knock on their door with in a few months. Bought my two-day pass and I’m ready for Stitches this Friday and Saturday. To say I can’t wait is the understatement of the–well, actually, it’s been two years; I had a bad case of the flu last February. So, yeah. Meantime, after a few days of unseasonably warm weather, 79F today when the average for 2/16 is 61F, this peach and my Santa Rosa plum went full speed ahead. I just hope the bees get to those flowers by Wednesday afternoon because we’re supposed to have a good hard rain then and on into Thursday, stopping (they say) a few hours before the doors open at the Santa Clara Convention Center for the people doing classes. No raining on the incoming knitters. I’m holding them to it. I knew, and yet finding this old photo it suddenly felt like I hadn’t known at all. 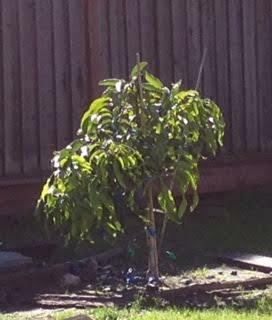 The mango tree February 2 last year and now. One year. And hidden in all those leaves, the ends of the branches are steadily working towards a big new burst of growth. My frost covers are barely holding it in at night as it is. Okay, that got me to look. Another startled surprise: hey! They’re selling much bigger ones than they used to (84×72 was the max I found last year), alright then, we’re good!